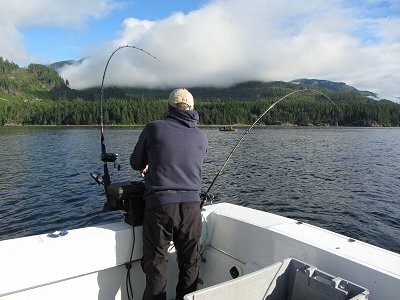 7th July, 2012: FISHING REPORT: Port Alberni Inlet, Barkley Sound, Ucluelet (West Coast), Somas-Stamp River System. The salmon fishing season is really moving along. It seems like it was just mid April and that we were just getting underway with anticipation of a great season rapidly closing in on us. In many areas one might say the fishing has been relatively hot but the weather to this point into early July has been surprisingly cold. While the rest of North America lays under an umbrella of scorching temperatures the Pacific Northwest has been two to four degrees celsius cooler than what it should be at this time of the year. The long range forecast however does show a remarkable improvement with temperatures reaching the thirties over the next week. Barkley Sound and the area around Bamfield B.C. has had some of the early seasons best fishing. 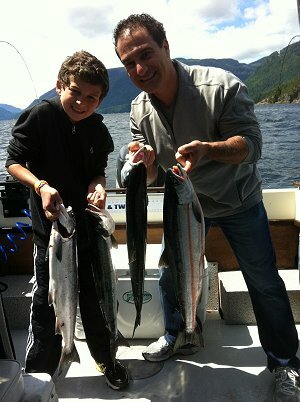 Tofino fishing has been relatively good over the last few weeks. Many areas outside of the Ucluelet Harbor are beginning to pick up as more and more of the migratory flow of salmon headed to natal rivers in the big southerly watersheds are beginning to show up in bigger numbers. Beg Island and Sail Rock had some good fishing over the past few days with Chinook in the twenty to twenty-five pound range and Coho in the five to seven pound range. The Port Alberni Inlet has had great fishing at times and on the other hand has had some poor days. The inlet has been very inconsistent due to the poor and very cold temperatures but returns are looking fantastic and the hope is that warmer temperatures will allow for some schooling of these fantastic Sockeye Salmon. We are looking forward to the months that lay ahead with magnificent opportunities for sport fisher persons targetting Chinook, Coho and Sockeye salmon. The Sockeye season for the sport fisher person really got off to a good start the week of June 18th. Most of the guides were limiting on twelve and sixteen fish per morning for guests. Many sport anglers were also doing very well. The Sockeye were moving into deeper water in the twenty five to fifty foot range and were forming schools. With continued poor weather after a few days of warm temperatures the water temperature of the Somass and the Port Alberni Inlet cooled and the fish began to once again migrate in shallower water which has made it diffiult to fish as there have not been the large schools of Sockeye that make this type of salmon fishing so remarkable. All of those in the sport sector in the Port Alberni area are hoping for a dramatic change in weather conditions and hoping that some of the Sockeye season can be salvaged. The last Sockeye forecast is now suggesting a return of just over one million two hundred thousand Sockeye which means there is still plenty of salmon to come this way. The latest Sockeye bullettin dated June 28th hsd given an escapement of ninty thousand plus Sockeye. The fish after leaving the Somass pass through counters which were put up in May and head to the Sproat and Great Central Lake systems. The returns to Great Central are nineteen thousand two hundred and Sproat Lake has a return of seventy-one thousand one hundred Sockeye salmon. The catch estimate to date is just over two hundred and eight thousand split between the first nations Somass River catch, recreation, gillnet, and seine commercial fisheries. The fishing when good for sockeye has been most productive using two or four dummy flashers with four flashers and lures with a leader length of twenty-two to twenty-eight inches in length. The best mp lures have been pink and black, pink and blue and some have been doing well just using black hooks. The black hook method is best behind a purple haze flasher and the mp hootchies behind green and red glow flashers. We are hoping for some good weather very quickly. Hopefully this happens and the Inlet water warms and the Sockeye go to deeper water and school in good numbers. The best salmon fishing in this geographical area to date has been in Barkley Sound. 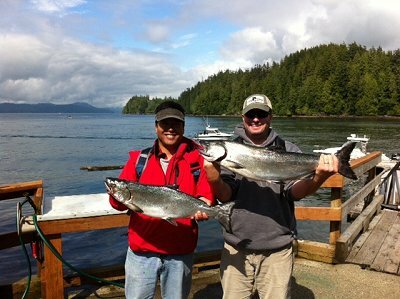 The areas around Bamfield have produced some very good salmon fishing. The fishing in the area has been good for almost a full month. Lately there has been a mix of Chinook and small Coho in the four to eight pound range. The Coho should really begin to put on weight over the weeks to come. These acrobatic sport salmon gain an average of a pound per week as they feed heavily on the rich resources of bait fish found in many of the locations around the Sound, the Bamfield areas and of course offshore. Close to Bamfield, areas such as Kirby Point, Sanford, the back end of Fleming Island, the Bamfield Harbor and Wall and Ship Island have all been producing some nice Chinook up to seventeen and eighteen pounds. There are also a good number of feeder Chinook in the mix from four to ten pounds. Coho are also in the area and are becoming more numerous on a daily basis.. The key has been bait. Wherever one finds the bait there has been feeding salmon. The big bait balls have been in 100 to 120 feet of water. If sport anglers fish in that level or wherever the big bait balls are one will usually have salmon hitting lures of choice. Of course the best bite is during the change of tide Different spoons and hootchies have been working well. Dependng on ones speed the leader length of various spoons can range from forty-six inches to six feet in length. Green nickel and blue nickel, knight rider, and Irish Cream in the three and a half and four inch size have all been working quite well in the areas around Bamfield. A variety of white and green hootchies with a 42 inch leader have been working. Needlefish hootchies still seem to be working the best. 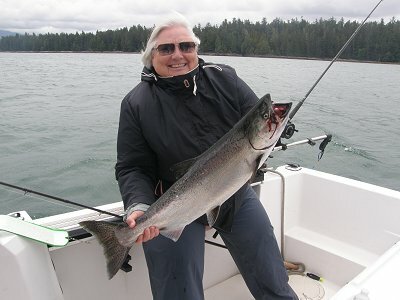 The many other areas in the scenic and pristine waters of Barkley Sound have also had some very good sport fishing. Meares, Austin and Cree have been the most consistent areas. Chinook have been plentiful around the deep trough at Cree Island and fishing close to Austin Island has produced some fantastic salmon catches. The last two days including July 3rd and the morning of the 4th we fished one boat on the backside of Meares with a group of Alberta guests. 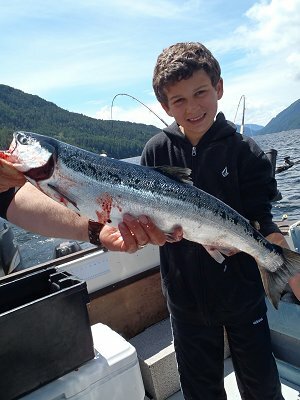 The fishing was fantastic as a big school of Coho ranging from seven to ten pounds had moved into the area. With strong northwesterly winds the bait was more than likely pushed inshore Chinook weighing seven to twelve pounds were also in the mix feeding on the bait fish. Most of the fish were clipped. The Green Nickel Coyote spoon in the four inch was working the best as well as the dark green spatterback needlefish hootchie with a forty-two inch leader. The watermelon spoon has also been quite good in this area for the last two days prior to this report date. The first part of summer has not provided some of the best weather on the west coast. Strong winds from the northwest and also southeast have been more prominent than usual. Most of the fishing has been inshore but on good days guides and sport anglers have been able to fish on the troll the various banks with the inner south and the Big Bank having some fairly decent results. Over the last week long beach has reported some bigger fish in the thirty pound range. Alley and Sail Rock also had some catches reported with bigger Chinook. Up until a week ago most of the Chinook and Coho catches were smaller fish in the seven to fourteen pound range. However it must be said that the school sizes were quite big making any fishing day that guides and sport fishermen could get out of the Ucluelet Harbor fairly action packed. We are expecting a big migration of salmon to begin to push on the West Coast. The big three watersheds to the south have forecast huge returns. The returns are predicted to be the best in ten years which means that the migration of fish down the west coast will be phenomenal over the next few months. Those having the success on the surfline of Vancouver Island and offshore waters have been using needlefish hootchies in the spatterback and the army truck pattern and colors plus a variety of three and a half and four inch spoons with cop car, green and blue nckel doing well. As the fish get bigger the spoon size should go up. Fishing depths are eighty to one hundred and thirty feet. The halibut fishing has been relatively good with long beach producing halis from fifteen to twenty pounds. The Big Bank out at the rats nose has produced some nice halibut fishing on the troll by bouncing the bottom at onehundred and seventy-five to two hundred feet. Salmon catches on the bottom and midwater on the big bank have also been decent. The biggest Chinook salmon in the Ucluelet Ladder Derby in June was thirty one pounds. There were a few bigger fish that have come onto the docks but the people were not entered. The Derby cost for the years entry is $50 and on a daily basis $10. This years fish off will be the weekend after Labor Day. There a terriffic monthly cash prizes.